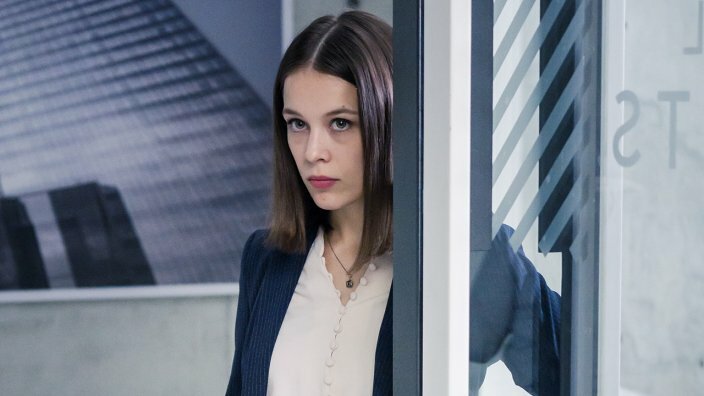 5 reasons why the turbo-charged German thriller is the TV series you need to watch now. The opening two minutes of Bad Banks set a superior standard that endures throughout this addictive series. If you aren’t already watching Bad Banks, you should be, and here’s why. Written by Oliver Kienle (Stronger than Blood) and directed by Christian Schwochow (NSU: German History X), the series takes a look at the male-dominated world of banking from a female player's perspective and has been nominated by some critics as the best show to come out of Germany, with a second series already commissioned. After receiving a wealth of critical acclaim since premiering at the 2018 Berlin Film Festival, Bad Banks became the first TV series to receive an invitation to screen at the 2018 Kino Film Festival in New York. The stellar cast is led by Paula Beer (Frantz, The Dark Valley) as young banker Jana Liekam. Beer, who was a jury member for The 1st Cannes International Series Festival in April, won Best Actress at the Bavarian Television Awards 2018 for her role in Bad Banks. From the wonderfully chaotic opening scene in a city street full of molotov cocktail-armed citizens rioting against tear gas-firing police, Bad Banks embarks on a high-velocity journey that hurtles from one European city to another as the tumultuous world of banking unfolds. Players push themselves to perform at a terrifying pace, while the show transfers between scenes rapidly yet seamlessly to explore themes that include greed, machismo and pressure to succeed — all with a sprinkling of cocaine. The perfection of sound artist Kyan Bayani’s edgy soundtrack elevates the already impressive visual presentation to another sensory level. Right from the first ominous electronic note accompanying the opening shot through a rain-drenched window over a city shrouded in grey, immediate tension and unease descend. The captivating first scene of a city in chaos is made even more gripping by the subtle repetitive electronic beat persistent throughout the mayhem. Bayani’s brilliant soundtrack is superbly woven through scenes, relentlessly cautioning that this perfect-looking roller-coaster ride will be a turbulent one. It’s relatable — how far would you go? How much of yourself would you be prepared to sacrifice to be a player in the male-dominated banking world? Your relationship, your values, your health, your loyalty? As a rookie banker competing in this ruthless world, Jana seems prepared to sacrifice all of this and more. After being fired from Credit International for someone else’s shabby work, she has a panic attack in her car while talking to her boyfriend, Noah (Jeff Wilbusch), on the phone. His practised reaction suggests this is not Jana’s first panic attack, and there are issues simmering away under her surface that may make an appearance later. But what does this mean for our brave, but somewhat callow heroine as she succumbs to the lure of status and the thrill of winning? Will Jana be able to cope with the manic, misogynistic, seemingly soulless world of high-end banking? Will she be able to endure Luc Jacoby (Marc Limpach), her bratty, cocaine-snorting senior co-worker, who also happens to be the CEO’s son and has a penchant for calling her “sweetie”? Bad Banks is about the European financial market, but its relevance is global. As Australia currently moves through our own Royal Commission into Misconduct in the Banking, Superannuation and Financial Services Industry, it’s timely for Bad Banks to hit our screens and give some insight into what lurks inside the murky world of banking. To date, 70 percent of alleged misconduct submissions to this Australian Royal Commission are in relation to banking — and if Bad Banks is any indication of reality, it is not hard to see why. Looking for a series about high finance that isn’t all just middle-aged men in suits? Then Germany’s Bad Banks is for you! The taut new spy drama brings together a great international cast of actors including stars from Tinker Tailor Soldier Spy and Game of Thrones. In its second season, Swedish drama 'Modus' is now an international thriller – and in Kim Cattrall, it’s found the perfect American president. The Scandi thriller has saved the best for last.